The 2018/2019 Atomic Hawx Magna 130 S was tested in the men's All-Mountain wide category at Silver Mountain Resort by the experts at America's Best Bootfitters, powered by Masterfit. You a big guy? Got a massive foot and calf? Like to ski but don't like the boot pain? 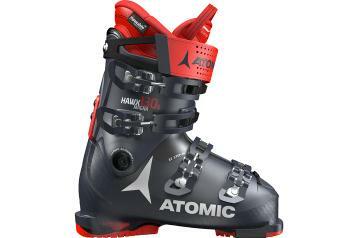 The 2019 Atomic Hawx Magna 130 could be your solution—testers say the comfort level is high, entry-exit is category tops, and they say this boot will prop-up a large dude in a super skiing stance. This boot returned unchanged to this year's test—well, some things changed, but they were only the scores. Higher this year—the big Hawx is gathering steam! The fit is large, Marge! One tester said he felt like a single bean in a very large burrito. Another said if you're foot is shaped like a potato, you're in the ballpark. Still another simply wrote: canyonesque. We like that, so eloquent. There are plenty of skiers with wide feet, high insteps and big, muscular calves. Those can be comfort deal-breakers and make skiing a total drag. The Hawx Magna 130 addresses all those issues, with a comfortable flex feel and enough backbone to support the big dude attached to the big feet. It's Magna—not magma or magnum—so it skis not like a volcanic explosion or a dirty Harry 357, nor an over-sized condom, but rather like the perfect combination of the three. Testers say it's strong enough, quick enough, and slippery enough to manage all terrain and snow conditions for a variety of different skiing styles. Testers agreed that the edge power is there once the boot rolls a ski up on edge, and given enough foot and leg volume to fill the canyon, quickness and steering marks would go up. A few testers thought it had a slightly over-edged feel (inside edge bias), which a cuff adjustment should sort out for any in the same boat. For a skier with a calf and instep so megalithic that the Hawx Magna 130's out-of-box fit is still too tight, he's in luck! The Memory Fit customization features allows the shell to expand around the foot and leg automatically after cooking the shell in an oven for five minutes—a great way to improve the fit at those tricky-to-modify areas. The 3D Gold Liner is loaded with Thinsulate for additional warmth. The Power Shift feature (which accounts for the "S" in the model name) allows for adjustment of the forward lean and/or stiffness.